Hello listeners, and welcome to the first episode of the Be Creepy With Me Podcast. We’re so so excited to bring to you an eerie and tragic mystery: The Dyatlov Pass Incident. There is a ton of information regarding this story, so instead of sharing it all here, we are going to provide the framework for the facts, some bits of information for the theories, and provide links to the amazing sites that cover the whole story and that we used for the basis of our research notes. On the episode, you will hear a summary of facts and some of the many theories surrounding this tragedy, but I would suggest that if you’re obsessive like us that you dive into story further. It’s a haunting and fascinating mystery, and therefore one of our favorites. We hope you enjoy the episode, and find the mystery as interesting as we do. 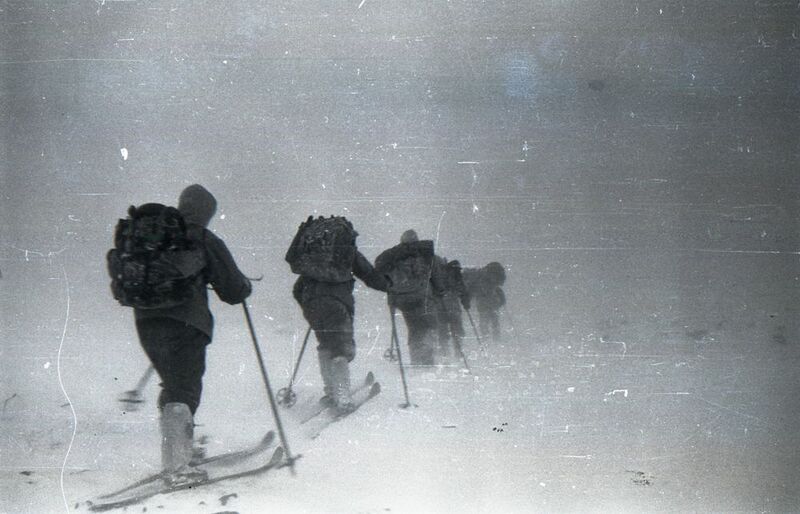 In January of 1959, ten experienced hikers set out on a 14-day hiking expedition into the Northern Ural Mountains with the goal of reaching Otorten Mountain. The group, consisting of eight men and two women, were all graduates or students of the Ural Polytechnical Institute (located in Yekaterinburg, Sverdlovsk Oblast, Russia). The hikers set out via train and arrived in Ivdel on January 25th, 1959, then hopped on a truck to Vizhay. They started their trek towards Otorten Mountain on January 27th. On January 28th, though, Yuri Yudin fell ill and was forced to turn back. Before his departure, Dyatlov told Yuri that they would telegram him when the group returned to Vizhay. The estimated date of return was approximately February 12th, though Dyatlov warned that they may be delayed, which was not unusual on expeditions such as this. The group carried with them multiple cameras and kept a diary of their expedition, which makes tracking their movements and knowing details of what happened next possible. Following a late start on February 1st, the group travelled about 2.5 miles and made camp 10 miles short of their destination on the mountain known as Kholat Syakhl, a Mansi name meaning “dead mountain” (the Mansi being the indigenous people living in the Ural Mountains). Camp was set around 5:00p that night, the group had dinner between 6-7:00p. It is noted in the diary that two of the members, Zolotariov and Thibeaux-Brignolles, stepped outside the tent to relieve themselves. What happens next is not known, but suffice it to say it was something terrible. When February 12th came and went, and even days later when there was no telegram sent from the group, Yudin and other friends and relatives requested that search and rescue be sent to locate the missing hikers. On February 26th, 1959, the abandoned campsite was found. The tent was found badly damaged and covered in a layer of snow, though the hikers’ belongings and shoes were found to be in relatively neat order. Upon closer examination it was found that the tent had been cut open from the inside, the zippered entrance of the tent left untouched. Footsteps found leading away from the campsite led investigators to believe that the hikers left barefoot or in socks. They followed the footsteps for 500 meters until they were lost in the snow, but the investigators continued in the same general direction until they came to the edge of a nearby wooded area. There, under a large cedar tree, they found the remains of an improvised campsite, a long-dead fire, and the bodies of Yuri Doroshenko and Yuri Krivonischenko. The two were found dressed far too light for the freezing temperatures, in underclothes and short sleeves, and without their boots. The large cedar showed damage, with broken branches and scraped bark, as if the hikers had attempted to climb it. It was concluded that the two had succumb to hypothermia, as no injury recorded by the medical examiner would have led to their death, though both had sustained injuries to their hands during their climb up the cedar. The next day, February 28th, between the cedar and the original campsite, the bodies of Igor Dyatlov and Zinaida Kolmogorova were found. Six days after that on March 5th, the body of Rustem Slobodin was also found in that general area. The three were also found to have succumb to hypothermia, and their bodies were posed as if they had fallen while attempting to return to the tent. There were no apparent injuries to the three, except for a minor skull injury on Slobodin, but it would not have killed him. It would be a further four months before the rest of the hikers would be found. On May 5th, in a ravine approximately 75 meters from the cedar, and further from the tent, the bodies of Lyudmila Dubinina, Semyon Zolotariov, Alexander Kolevatov, and Nicolai Thibeaux-Brignolles were found under four meters of snow in a ravine. They had dug out a den in the snow, and laid branches down in an attempt to keep themselves warm, but despite this their bodies were actually found a few feet from the den. Three of the hikers found in the ravine had massive fractures and internal crush injuries. In fact, the medical examiner would come to compare the injuries of the four to that of a devastating car wreck. Dubinina suffered chest fractures that caused a massive hemorrhage in the heart's right atrium, was missing her eyes, and was missing her tongue. Zolotariov also had chest fractures and was missing his eyes. Kolevatov was thought to have died of hypothermia, but he also had major injuries to his neck and head. Thibeaux-Brignolles had a massive skull fracture. Infrasound – a low-frequency sound that can be both natural and man-made, known to cause feelings of fear, uneasiness, sorrow, revulsion, and panic. Perhaps it could have been caused by the high winds in the area. Yeti – a yeti or Alma is a bipedal human-like creature thought to inhabit the mountains of Russia and other nearby regions. Sightings of the Alma had been reported in the area for years leading up to incident. Avalanche – the natural occurrence was not unheard of in the area, though it is thought that the campsite would have been destroyed completely if one had occurred. It is also possible that the fear of an avalanche could explain their quick departure, but why would they have not returned to their camp once it was obvious they were in no danger of an avalanche? KBG/Weapons Testing – there had been reports of government weapons testing occurring in the area, as it was not a populated area. Perhaps their death was accidental, as the government could possibly have not known that they were in the area, but it is also possible that they were purposely used as test subjects. Also, it is reported that several pieces of clothing belonging to the hikers were found to have abnormally high levels of radiation. Mansi Tribe Attack – the Mansi people were known to be in the area, but it is unlikely that they would have attacked the hikers as they were known to be a quiet and peaceful people. Also, there was no evidence of an attack or pillaging of the campsite, and no injuries on the hikers were typical of such an attack. Animal Attack – a logical conclusion, considering the missing tongue and eyes of two of the hikers, but as with the Mansi Tribe theory, there is no evidence of animal attack – no tracks, no injuries, no signs of scavenging. UFO/Aliens – a second group of hikers not far from where the incident took place reported that they saw strange lights in the sky in the area where the hikers were camped. The area has a long history of similar reports, and continues to to this day. More evidence to support this theory is the strange final photo of a roll of film found in a camera on one of the bodies. There are many more theories. You can find information on them and further information on the theories listed above by exploring the links below. Dyatlov Pass - this amazing website chronicles the entire incident, with profiles on each of the hikers, the diary entries, medical examiner notes and photos, list of theories and explanations...everything you need to explore this mystery. Kudos to the thoroughness of the creator of the site and all the work they put into it. Atlas Obscura - the folks of Atlas Obscura are so talented and their site is a treasure trove of weirdness and curiosities, and I loved the article they posted about the incident. Unredacted - a fascinating look at the theory surrounding UFOs and Aliens. Very well done and very convincing. Science Times - a scientific exploration of the incident, very much worth the read. Dead Mountain - the site for a book all about the incident, entitled "Dead Mountain" by author Donnie Eichar. Wikipedia - well of course we started with Wikipedia.